Dead animal smells in a wall are most often caused by mice that have chewed wiring and been electrocuted or have consumed poison. It is difficult, if not impossible, to remove a dead animal in your wall, so you need a dead animal smell removal product that works even when the carcass is still in the wall. The smell of a dead mouse can last for weeks, so you need something strong and long-lasting to eradicate that dead animal smell in the wall. Smelleze® Reusable Dead Animal Smell Eliminator Pouches can remove that dead mouse smell in the wall and, with reactivation in sunlight, do so for weeks or even months. Where oh Where is that Dead Mouse Smell Coming from? The disgusting smell of a dead mouse in your house can be more than most families can stand. Add to that the discovery that the dead animal smell is coming from a wall, which cannot be accessed to remove the dead mouse, and frustration can quickly mount. You need help in getting rid of that dead mouse smell in your wall – fast! When tackling a dead animal smell in a wall, you need to find where the stench is strongest in order to locate the dead mouse. The easiest, though unpleasant, way to do this is to simply: Follow your nose! Like a bloodhound with vulture DNA, you will have to conduct a sniff search. First, figure out which room has the strongest dead animal smell, keeping in mind that the stink may travel through the ductwork of your heating and cooling system, making the dead animal smell seem to be everywhere in the house. Once you have decided which room is stinkiest, sniff along each wall about waist-high. Pay special attention around electrical outlets, as this is often where a mouse has chewed through wiring and has been electrocuted. The dead mouse smell may also be in the wall near the baseboard, as the sick or dying mouse will fall from traveling along wiring, or will have chewed the wire and fallen to the bottom of the wall when electrocuted. Retrieving a dead animal from the wall isn’t impossible, but will create substantial damage to the wall when a hole is cut to gain access. Removing the dead mouse from the wall can’t always be done, but you can still take effective steps to remove the smell the dead mouse creates. When you have found the spot in the wall where the dead animal smell is strongest, you can now concentrate your de-stinking efforts on the source of the dead mouse smell. Stop! Before you reach for that spray can of ‘air freshener’ and unleash a monstrous micro-mist cloud of chemically-induced fragrance, you need to know that there is no ‘air freshener’ made that can overwhelm the stench of a decomposing dead mouse. Not only are these products an ineffective solution to the dead animal smell in your wall, but they also deposit a layer of chemicals on every surface they touch, while aggravating allergies and respiratory problems. Why Does that Dead Mouse in your Wall Smell so Bad? At the first whiff of dead animal smell in your house, you can take steps to eliminate it. The fact that you can smell the dead animal proves that the odor is air-borne. This means decomposition has reached the point where gases are being expelled from the carcass. Bacteria and natural fermentation of organic material combine during decomposition to create an eye-watering stench that is continually compounding. The dead mouse smell goes through several putrid stages until the carcass finally dries out and no further odor can be created. All the time that this disgusting biological process is going on in a wall of your house, you and your family are subjected to that terrible dead animal smell, if you leave it untreated. If the carcass is still in the wall, the decay process can go on for weeks or even months, depending on the size of the dead animal. To eliminate dead animal smells in a wall of your house, even from the first moment you notice it, you need a natural odor removal product that bonds with and eliminates air-borne odor molecules: Smelleze® Reusable Dead Animal Smell Eliminator Pouches. Smelleze® Pouches are highly effective in eradicating the dead animal smell created when a mouse has died in the wall of your house. Remember: if you can smell the odor, it is air-borne – and Smelleze® Pouches are specially developed to eliminate air-borne odors. Simple to use, affordable and discreet, Smelleze® Pouches can be hung or placed near the spot on the wall where the dead animal smell is strongest. If the dead mouse smell comes from an area of the wall that is near ductwork or air vents, that stench can be drawn into the entire house. To avoid this, simply place or hang Pouches near return air vents. You may also wish to check your furnace/air conditioner air filter to see if it has been permeated with the dead animal odor. If it has, simply change the filter. Smelleze® Pouches offer the additional benefit of being reusable, thus providing you with long-lasting dead animal smell removal. Pouches can be reactivated by placing them in direct sunlight for an affordable odor solution that will continue to eliminate the dead animal smell in your wall for weeks or even months. 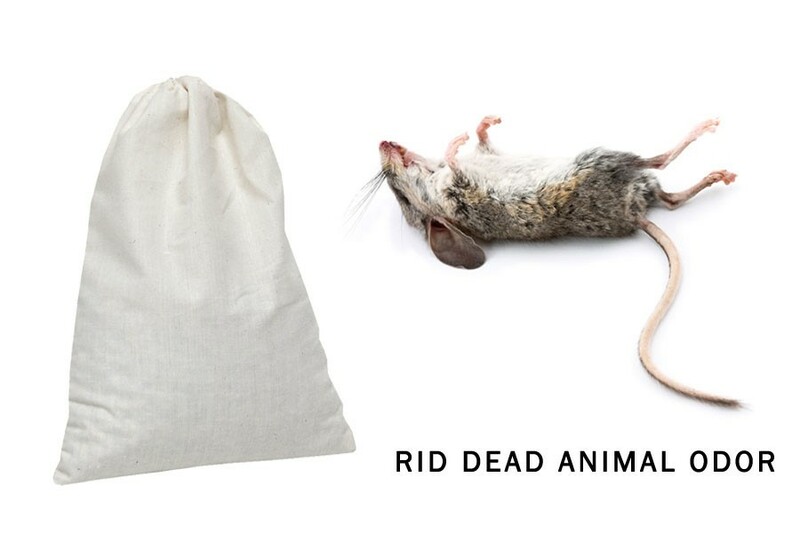 NoOdor.com’s Smelleze® Reusable Dead Animal Smell Eliminator Pouches are the perfect long-lasting odor removal solution for dead mouse smells in the wall of your house. Easy to use, reactivated in sunlight, all-natural ingredients – Smelleze® Reusable Pouches clear the air of dead animal smells in your walls. Hang a Pouch and breathe deep!